During my Presentation magic workshops, I often roll out one of my favourite New Yorker cartoons, now animated and available on iTunes, called Satan’s Software. It features the Devil in Hades interviewing for a new “position” on his team. Seated opposite him is a candidate to whom he poses the question: “I’m interested in someone well versed in the art of torture… do you know Powerpoint?” I often use the slide when discussing Donald Rumsfeld’s Powerpoint slide for the management of Iraq after the coalition of the willing had succeeded in its mission. Today in the Australian independent website, New Matilda, I found published a rather similar cartoon, which attempts to also offer “opinion” on current airline security, terrorism and governmental response. 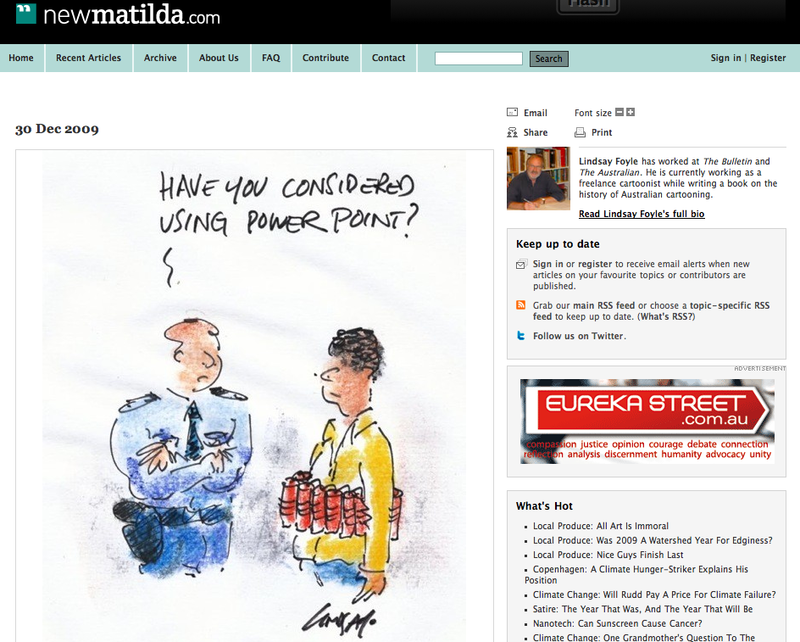 The cartoonist is Lindsay Foyle, and here’s the screenshot (click on it to enlarge) of the New Matilda page where his cartoon appears today.